To misunderstand the given is nothing less than the instantiation of relations of heterogeneity, of appearing otherwise in a world, of creating other possibilities for meaning. The double signification of misunderstanding, as Rancière has noted, is both that of failed apprehension and of disagreement based on the misinterpretation of signs. Construing misunderstanding as a negative event reveals a will to solidify meaning, to freeze sense-making in language, to petrify the interpretation of gestures and modes of identification, as if we live in a world where words and images define things absolutely. If we are to elicit or provoke a commitment to the political capacities of art, it is here, where the “absolute” interpretation of ethics (the lamented ethical turn) as imperative, as norms-turned-law, demands a transformation of the semantic state. The articulation of misunderstanding, the supernumerary apprehension of a good that generates misunderstanding, affirms the contingencies among signs and semantics, between what is given and what is possible—it does not delight in revealing the actual state of things, but disentangles the actual from the sensible constraints of unconditional reification. It is in the artist’s unstable, task-less, and speculative work of creating conditions of and for sensory misunderstanding that demands a situated fidelity to an intangible good; a faithfulness to potential modes of sensibility in the face of a normative will for consensual semantic and operative fixity. When we refuse the (limiting) definition of “ethics” as a stand-alone abstract principle, but instead deploy it as something that can only be practiced in relation to a situation as a gesture of relation, of “withness” relative to an imagined mode of otherness, we are confronted with the fundamentally ambiguous call of all artistic practices: to perceive a virtual, murmuring, and not-yet-existing demand, and to orient our material (or immaterial) actions in fidelity to the politicity proper to shared autonomy. 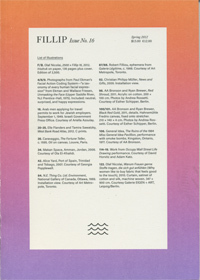 Patricia Reed, "Co-autonomous Ethics and the Production of Misunderstanding" in Fillip 16, 2012, 27-33.